Southeast Saskatchewan is a place of many colours; brimming oil reserves, well-groomed parks, lush valleys, rock formations and even areas of dense forest! Despite these seemingly un-prairie like surroundings, there is still plenty of prairie grain belt and farmland in the region. Pay the Southeast Saskatchewan region a visit, and discover just how diverse Saskatchewan can really be! Experience the warm hospitality of the Saskatchewan people in Weyburn, where the people are always happy to welcome new visitors. Meet the locals at 'Hospitality in the Park', see the world's largest collection of curling memorabilia, or the largest collection of silver in Canada! This recreational hot spot offers golf, horseback riding, waterslide parks, shopping, go-carting, tennis courts, a casino, and shopping facilities, as well as traditional park activities such as camping, hiking, and boating. Check out the local resort town of Kenosee for a summer night you won't forget! From the scandal of Al Capone's bootlegging days in the tunnels of Moose Jaw to the T-Rex skeleton discovered here in 1991, there is never a dull moment, as history is still in the making here! 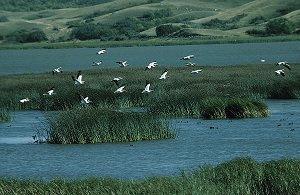 Tear through the sand dunes near Leader, fish to your heart's content in Lake Diefenbaker, or spot endangered birds in Grasslands National Park. If you're up for discovery, this is your region. Take a tour of the infamous Tunnels of Moose Jaw, where Al Capone and his cronies hid from the authorities. Ride on a trolley car and tour Moose Jaw's murals and streets. Try your luck at Casino Moose Jaw, decorated in the art-deco style of the roarin' Twenties, then relax in mineral-rich waters at the local Mineral Spa. Book accommodations in Moose Jaw and get in on this hidden hub of excitement! This friendly prairie community is waiting to welcome you to its sunny spot by the creek. Learn about the region's history and culture through museums and galleries in the city. Nearby Cypress Hills Interprovincial Park is a unique mosaic of forest and grassland, and is home to rare flowers, plants and bird species. Be sure to explore Eastend's T-Rex Discovery Centre, the site of an almost entirely complete T-rex skeleton discovered several years ago. For first-rate fishing, golfing, boating and sailing, stop at Lake Diefenbaker, the largest body of freshwater in southern Saskatchewan. Nearby Saskatchewan Landing, Danielson, and Douglas Provincial Parks offer additional camping and hiking opportunities. We offer a complimentary hot breakfast served each morning, you will have various choices from sausages, eggs, waffles, whole fruits, yogurts, bread's, pastries, and cereals. Our rooms feature both king size and two queen size accommodations, all rooms include complimentary Wi-Fi, in-room coffee, microwave, mini-fridge, 32in LCD TV, iron and ironing board, and full three-piece bathroom. The Estevan Motel 6 is conveniently located off Highway 39 in the beautiful city of Estevan. This location offers a guest laundry facility, 32" TVs and free high speed internet. Micro-fridges are available. The Heritage Inn in Moose Jaw is a full service, modern facility. It is located at the north end of Main Street - just a half mile south of the junction of Highways 1 and 2. Easy access from both major highways and close to all major attractions. Our 104 rooms include 5 executive suites, 2 new one bedroom Jacuzzi suites, handicap accessible & nonsmoking rooms. Situated off Route 2 in Moose Jaw, this hotel is only 2.3 km from the Temple Gardens Mineral Spa. It offers free private on-site parking for trucks and RVs. Each morning the hotel serves a continental breakfast with pastries and hot coffee. Several steakhouses and pizza restaurants are less than 7 km away. This hotel is 550 meters from the Western Development Museum. Our hotel is conveniently located near Town 'N' Country Mall, Casino Moose Jaw, Temple Gardens Mineral Spa, Western Development Museum and Lynbrook Golf & Country Club. Guests of this Moose Jaw hotel will also enjoy tours of the Tunnels of Moose Jaw. The site gives visitors a look at the city's prohibition-era ties to Al Capone and Chicago, as well as immigrant populations in the area. At our hotel we offer, cable TV and a microwave, a seating area, a coffee maker and a work desk, and select rooms offer a kitchenette. Breakfast meats, cereal, coffee, juice and a choice of breads are offered daily. An indoor pool with a waterslide is available and guests can relax in the hot tub. Our new Motel 6 Moosomin is conveniently on the Trans Canada Hwy. All rooms are non-smoking. Wood-effect floors, bathroom with granite countertops and a raised wash basin. Free Wi-Fi, 3 acres of truck & RV parking, coin laundry, kitchenettes, and 32" LCD TVs. Free local calls, morning coffee, expanded cable. Kids 17 and under stay free, vending machines and ATM, coin laundry, Green Key Eco-Rating.